Exploration drilling is used to do exactly that, explore underneath the Earth’s surface, but what’s the endgame? Well, drilling crews in Queensland and New South Wales perform exploration drilling on a test site to check and see whether it contains any valuable resource like rock minerals, gas or oil. This type of drilling can be lucrative when searching and finding valuable ore or other worldwide required resources like petroleum which is used in automotive and various machine operating industries. So how is this accomplished? Well first, a dig site has to be selected. Advanced technology allows a drilling crew to survey the area for potentially useful resources through a number of methods like gravity, magnetic, passive seismic, and reflective seismic survey before drilling begins. Then a drill is used to penetrate the target site. As the drill digs deeper into the Earth’s surface, a core sample is extracted within the drill bit. After the sample is recovered experts at the drilling rig will analyze it and determine whether or not the site holds sufficient value. If they find that the drilling site contains something useful, drilling crews can bring larger rigs to attach to the drill to begin a more thorough extraction process. Sometimes, drilling may be done several times throughout the testing area. The site will be continually analysed to ensure that there is enough potential for valuable resources which will guarantee revenue. When probing a site for petroleum, oil companies will use geologists to determine how much oil is in the target site to see if it’s worth the resource cost of drilling further. A site that doesn’t offer enough resources can end up costing an exploration drilling company a great deal more than just moving on to another site. Before oil and gas can be extracted from the Earth, a suitable drilling hole must be made to extract, process, and store the resource. A poorly developed well can prove costly to the drilling company. 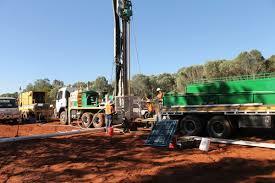 However, drilling exploration isn’t simply used to extract minerals and materials like marble and granite. In some cases, scientists, specifically geologists, use exploration drilling to study the geological composition of a site. This is an excellent tool for archeologists and anthropologists looking to recover vital information about lost cities and civilizations and recover their artifacts for further analysis.